A promising hip-hop rhymer from Los Angeles finds herself in a gray area when a record producer offers her a compromising shot at stardom. I was able to catch Filly Brown this past Wednesday courtesy of AMC Stubs. It's open to limited release tomorrow April 19th. If you've watch the trailer, you can't help but draw comparisons to Eminem's 8 Mile. The opening scene is similar with the lead character Majo who later adopts the stage name Filly Brown on a bus passing the downtrodden areas of East LA. 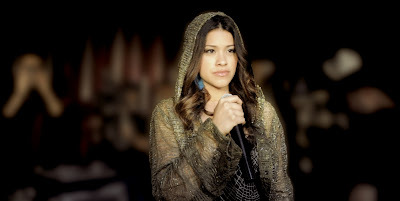 Majo is played brilliantly by Gina Rodriguez who it not a natural rapper like Eminem but plays the role like a seasoned professional. Majo is an aspiring hip hop artist who struggles with her family and trying to succeed. The casting is amazing including Jenni Rivera playing Majo's incarcerated mother in her first and final film. Jenni Rivera is well known for her singing, unfortunately she along with six others died in a plane crash late 2012. Another standout in the film is Majo's sister Lupe played by Chrissie Fit. She has some of the best comedic lines and shows a great repertoire with Gina's character. Veterans Lou Diamond Phillips and Edward James Olmos, whom I am both big fans of does a good job as father to Majo and Lawyer respectively. The two different music producers that works with Majo are a little over the top in their character, but in a amusing way. The music which is an original score just for the film is riveting and catchy especially coming from the smooth voice of Gina. So with so many positives going for the film, what could possibly go wrong? Where it falters most is the plot. The movie tries to do many things with so many side plots going on at the same time. Besides the main story of Majo's transformation and rise as Filly Brown, we have the story of her dad tried to better himself and his former gang, her sister's Lupe relationships, her relationship with her mother, her mother's situation in jail, her romantic relationship with DJ Santa, etc. They all tend to tie together but at the same time you're thrown all over the place. When I attended the screening, before the movie started, we had about a half hour wait. They blasted one of the main songs in the movie over and over again as they had it on loop. Such that you can't help but hate the song a little for being overplayed. Note to future screeners, please do not do that! Overall, I give the film 3.5 stars out of 5.0 slightly nudging out Oblivion. You would not be disappointed however seeing either films or even both this weekend. If you haven't seen 8 Mile before, I would recommend watching Filly Brown first and then 8 Mile.